Bali Round Trip 10 Days and 9 Nights Packages is exciting trips to explore the island of paradise from east, north, west, and southern part of the island. Bali offers an incredible wide variety of attractions, panorama, culture, temples, rice terrace, waterfall and friendly people. Thats why we design this packages with easy planning for your holiday, our friendly english speaking driver and comfortable air conditioning car will lead you during the trips. Our driver will meet and greet you at Bali airport on your arrival then we will transfer to your hotel in Sanur for overnight. The trips will be start at 08.30 AM from your hotel then we will take you to our first destination Batubulan village where you will watching Barong and Kris Dance for one hour. Then the tour will continue to visit Celuk Village known as the center of gold and silver in Bali. Kertha Gosa is next journey where this place known as the hall of justice, then only ten minutes drive we will visit Goa Lawah Temple. This temple is dedicated to the god of the sea and also the god abode on mountain, lunch will be serve in local restaurant. After lunch we will continue the tour to visit Tenganan Village, it was amazing to walk through the tranquility of the ancient village. Then we will take you to your hotel in Candidasa for overnight. We will pick you up at 08.30 AM from your hotel then we are going to visit Besakih Temple for our first destination, you can see the amazing attraction of actual complex of temples which is located at southern slopes of Mount Agung Bali. Then the next destination is visiting Kintamani Volcano, this tourism site has magnificent panorama of active volcano and lake batur. Lunch will be serve here, then after lunch we will take you to visit Beji Temple, for local people this temple known as Pura Subak it is a holy place to worship Dewi Sri as the goddess of rice and the symbol of prosperity. Then we will transfer you to your hotel in Lovina for overnight. We will pick you up early morning at 05.30 AM then drive you to Lovina Beach to watching dolphin in the ocean, you will use traditional boat to the ocean for this activity. Then we will drive back to your hotel for shower and breakfast, after breakfast we will continue the trip to visit Buddha Temple, this monastery was a beautiful drive up towards the mountains. The trip will continue to visit Banjar Hot Spring, its lovely warm (like bath water) and the spouts were so powerful at one section it was like a very strong massage with water pouring down your shoulders and back. Lunch will be serve in local restaurant then back to your hotel for free and leisure. No tour on the day, only stay and relax in the hotel. Get fresh after free and leisure on the day before, we continue the trip and our driver will pick you up from your hotel at 08.30 AM. Our first journey is visiting Gitgit Waterfall, this tourism site is impressive and the lush vegetation and peaceful surroundings. The tour proceed to Ulun Danu Lake Beratan Temple, this temple is very famous for its beauty that has become a favorite tourist spot in Bali. Lunch will be serve in local restaurant then after lunch we will take you to Candi Kuning Fruit Market. The trip will continue to Jatiluwih Rice Terrace, is a beautiful rice terrace unfolding from batukaru mountain until the coastal side. 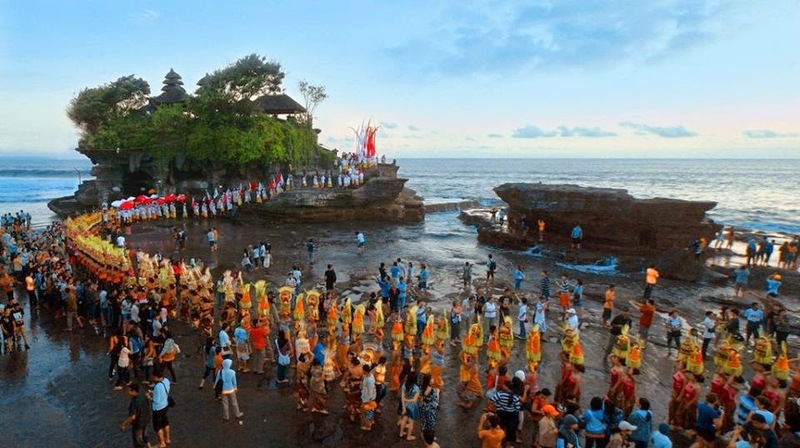 The last of the trip will be visiting Tanah Lot Temple, its a pilgrimage temple in Bali and one of the most sketched and photographed temples in Asia. Then we will take you to your hotel in Ubud for overnight. The journey is to discover Ubud village and Denpasar city, we will pick you up at 08.30 AM from your hotel and drive you to Ubud Monkey Forest, you can spend your time looking at the monkeys going on with their lives. The trips proceed to Ubud Palace, the palace has many ornate corners and was mostly built after the 1917 earthquake. Only located in front of the palace we will visit Ubud Market, this is the perfect place to buy presents for the ones at home. Lunch will be serve at local restaurant then we continue to our next destination of the trip to Bajra Sandhi Monument. This monument is symbolic of Balis struggle against the dutch colonists, then we proceed to visit Jagatnatha Temple, the highlights of the temple is the Padmasana or central altar that is dedicated to siwa. Then we will visit Bali Museum for our last trip before going to Kuta for overnight. Start pick up at 09.00 AM from your hotel then we will take you to Tanjung Benoa Nusa Dua to do water sport activities such as Jet Ski, Parasailing and Banana Boat. Then we will serve your lunch in local restaurant, after lunch we will visit Garuda Wisnu Kencana Culture Park, the statues were enormous and there is a couple of dance performances every day. Then we will take you to Dreamland Beach, the beach is one of the beautiful beach with white sand. Then we will take you to visit Uluwatu Temple, the views off the cliff are outstanding, the air is fresh and the scenery is beautiful. Kecak and Fire Dance is the last of the trip that you can see beside the temple before going back to your hotel. Free and leisure all day in the hotel.